Two months ago, my youngest son lost his iPhone while being entertained in a karaoke outlet. He was tipsy after a few glasses of beer, and forgotten where he had left the phone. He tried to call his phone number but the person who took the phone had apparently locked it and had no intention to give it back. Few days later my eldest grandson was robbed away his new iPhone while travelling in a taxi in Shanghai. He couldn't believe a taxi driver had intention to cheat an innocent child. Repeatedly he attempted to call his number, but the daring cab driver refused to respond. Gone was his phone he loved so much. Two days ago while on a short holiday at a resort, I found an iPhone while walking around the playground. It was the latest model with bright red frame. The phone was locked and I couldn't call out to reach it's owner. With little darling with me, we both waited at a nearby restaurant for the phone to ring. True enough! A short while later, the panic owner called and I told him that the phone was with me. Immediately not too long, a handsome young man appeared in front of us. He was too pleased to see us with his lost phone. He wanted to pay for our meals which I declined. I told him he didn't have to do any favour, except be more careful in keeping his phone. The phone might not be expensive, but the information in it is definitely very costly to loose. He left with many thank you said, and promised he would be more careful in his way of life. The first... By being not honest to return, founder of the phone felt excited and happy. The second... By cheating, the person felt great and thrill to achieve his motives. The third... By being honest, the giver felt happy and joyful. Conclusion: Everyone of us needs different energies to satisfy our inner self. The bad cannot survive as good, and neither the good can live to act as bad. 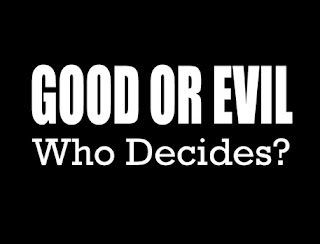 So whether you like it or not, we have to face the reality of life as good and evil are inseparable. Btw which type are you young man then? i have no idea because life is full or possibilities, i might say i am good guy now but end up doing bad things? who knows?